Wide Asleep in America: GAZA and DOLLS: The Facade of Impartiality Crumbles with Proof of Favoritism in the Face of "Collective Punishment"
GAZA and DOLLS: The Facade of Impartiality Crumbles with Proof of Favoritism in the Face of "Collective Punishment"
The crisis in Gaza is not fake. It is very real and it is very serious. The complicity of both the EU and the US is not shocking, but is indeed appalling. UNITED NATIONS, 23 January (IPS) - Despite intensifying calls for international pressure to address the fast deteriorating situation in the Gaza Strip, observers and some diplomats say the UN Security Council has proved as ineffective as it has been for many years concerning issues related to the Israeli-Palestinian conflict. On Tuesday, the Council called an emergency meeting during which a vast majority of delegates strongly condemned Israel's blockade of the occupied Palestinian areas and charged that it was violating international humanitarian law. Yet at the end of the day, the Council failed to adopt a draft presidential statement calling for Israel "to ensure unhindered access for humanitarian assistance to the Palestinian people and to open the border crossings to facilitate the passage of exports and imports to the Gaza Strip." Why? Because it was not acceptable to the US delegation, a diplomat present at the meeting told IPS. The US rejected the first draft statement because it did not cover Israeli concerns about rocket fire by Palestinian militants into its territory. The Council called another meeting Wednesday, but failed to issue a presidential statement based on the third draft, which, according to the source, was prepared by the diplomats representing the European Union. "We were hoping ... but unfortunately we have not agreed," South African ambassador Dumisani Kumalo told reporters about the outcome of the Wednesday's meeting, adding that "everybody [in the Council] said they wanted the Security Council to speak out." Asked why the Council is discussing a presidential draft statement instead of a resolution, the South African envoy told IPS: "We thought we would be able to speak quickly, but it's not so quick." A presidential statement is usually non-binding and not enforceable, but it requires the consensus of all 15 members of the Council. A resolution, which requires a majority of votes and can be sunk by a veto from one of the five permanent members, is often legally binding and enforceable. A European diplomat said the US objected to the latest draft, even though it addresses concerns about rocket fire by the Palestinians into southern Israel. According to him, without explaining the sticking points, the US delegates said they needed more time to consult with Washington. On Tuesday, US ambassador Zalmay Khalilzad told the Council that Washington was equally concerned about the situation in Gaza and that the US would continue to provide humanitarian aid to the Palestinians. But at the same time, he fully supported the Israeli view that it was the Palestinian militants who are responsible for the misery of their people. "We believe the current situation is a direct result of Hamas's policies and actions," he said, adding that the United States "condemns in the strongest terms the ongoing firing of rockets and mortars from Gaza into Israel by terror groups." In defending the virtual siege imposed on Gaza, the Israeli diplomat Gilad Cohen said the current situation is the "consequence of many choices, repeatedly the wrong choices, made by the Palestinians, to adopt terrorism and violence over peace and negotiations with Israel." Except for the European Union, Israel's contention that the Palestinian militancy is responsible for the blockade and power shutdown in Gaza is being forcefully rejected by all the major political blocs within the UN system, including the Non-Aligned Movement (NAM), the Arab League and the African Union. "The violent military escalation by Israel constitutes a grave breach of international law, including humanitarian and human rights law," said Cuban envoy Rodrigo Malmierca Diaz in speaking before the Council on behalf of the 118-member NAM. Like other regional groups, NAM wants the Council to take immediate action to ensure the supply of food, medicines and fuel to the Gaza Strip and to ask Israel to stop using its military might against Palestinian civilians. While critical of the Palestinian rocket attacks, the EU has described the continued Israeli incursions into the occupied areas as "collective punishment" of 1.5 million Gaza residents. Various UN agencies responsible for delivering humanitarian aid and Western rights advocacy groups have also raised grave concerns about the suffering of the Palestinian civilian population in Gaza. According to the UN Office for the Coordination of Humanitarian Affairs, about 80 percent of Palestinians in Gaza live in extreme poverty and depend on aid agencies for food and other essential items. The World Health Organisation (WHO) said Tuesday it was worried about the functioning of intensive care units, operating theaters and emergency rooms in Gaza as a result of frequent power outages and border restrictions. The WHO estimates that only 50 percent of basic commercial food imports were met during the past two months. On Wednesday, thousands of Gazans streamed through a breach in the border wall with Egypt to buy food and medicines. The Gaza strip along the Mediterranean shoreline is only nine kilometers wide and forty kilometers long, with its borders sealed on all sides. Israel cut off fuel shipments to the main power plant in Gaza last week, but has since allowed a very limited amount of diesel and medical supplies across the border. On Tuesday, speaking in Geneva about the situation in Gaza, the UN's top human rights official Louise Arbour urged the international community to meet its due responsibility to protect civilians "in particular where and when the authorities concerned are unable or unwilling to do so." "The people of Gaza," she continued, "look legitimately to the international community to respond with urgency and with appropriate measures to their desperate and still worsening situation." Some of the world's leading independent human rights defenders, such as the London-based Amnesty International, have made similar calls about the need to protect the civilian population in Gaza and southern Israel. It remains unclear, however, whether or not the Council will respond with prompt action. On Thursday, it is due to meet again to see if Washington is willing to accept what the rest of its members are saying. In the past, the US has vetoed more than 40 Security Council resolutions condemning Israeli actions. The United Nations Human Rights Council said Thursday it deplored the "grave violations" being committed by Israel in Gaza, and demanded that the week-long siege of the Strip be lifted. The 47-member council adopted a resolution presented by Arab and Muslim states by a vote of 30 states in favor and one against with 15 abstentions. One delegation was absent. Delegations from the United States and Israel, which both have observer status at the Council, boycotted the two-day session, diplomats said. The U.S. and Israel termed the discussion one-sided, due to the fact that it completely ignored the ongoing Qassam rocket barrages fired indiscriminately by Gaza militants at Israeli civilian communities. Israel's envoy Itzhak Levanon dismissed the criticism as the latest in a "long history of vitriolic attacks" on his country. "The main challenge Israel faces is to defend itself from terrorist organisations that use populated areas for cover in order to launch rockets and mortars into Israel," he said in a statement. Israel did "everything possible" to spare civilians. Most of those abstaining from the vote were Western states, including France, Germany and Britain. UN Security Council members China and Russia supported the resolution, and Canada was the lone vote against it. It was the third time that the Geneva forum, set up in June 2006, rebuked Israel at a special emergency session called to address conditions in the Palestinian territories. Mohammed Abu-Koash, the Palestinian ambassador to the UN in Geneva, told the talks at a special emergency session called to address conditions in the Palestinian territories, that Israel's siege and raids in Gaza constituted "war crimes". "We hope the resolution will trigger international pressure and action to lift the Israeli siege and restore supplies of food, fuel and medicine, open border crossings and end repeated Israeli military attacks throughout the occupied Palestinian territory," he said. UN High Commissioner for Human Rights Louise Arbour, in a speech on Wednesday, denounced Israel's "disproportionate use of force and targeted killings" as well as Palestinian militants' firing of rockets into Israel. Arbour, a former UN war crimes prosecutor, told the forum that international law forbids collective punishment and said Israel should lift all restrictions on aid intended for Gaza. "All parties concerned should put an end to the vicious spiral of violence before it becomes unstoppable," she warned. Syria's ambassador Faysal Khabbaz Hamoui, speaking on behalf of Arab states and the Organisation of the Islamic Conference (OIC), accused Israel of turning Gaza into a "huge prison." "The real aim of Israel from these aggressions and crimes is to deliberately abort all Arab and international efforts to invigorate the peace process," he charged. Egypt's envoy Sameh Shoukry, speaking for African countries, urged Arbour's office to conduct more regular visits to the Palestinian territories and report more extensively "on all violations emanating from the Israeli occupation". And this moving piece from Amira Hass entitled "They Neither See nor Remember." Meanwhile, outlets like the New York Times and the BBC are doing their best to place the blame squarely on the Palestinians with reports like this one entitled, "Gaza's rocket threat to Israel." And, of course, it's becoming more and more clear (to people who might not have known this all along) that unless a presidential candidate pledges his (or her) unmitigated support of Israel and its destructive agenda, he (or she) has no chance of staying in the race for new nightmarish tyrant. Zalmay Khalilzad, the U.S. ambassador to the UN, found a short letter in his mailbox two days ago. The sender: Barack Obama. 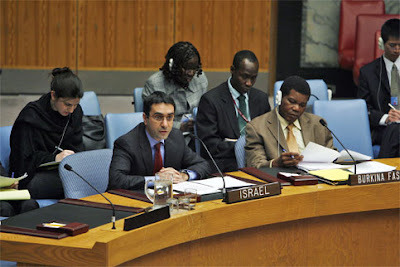 The subject: The Security Council meeting regarding the situation in Gaza. "I urge you to ensure that a Council resolution won't pass that does not "fully condemn" the Qassam attacks on Israel," Obama wrote. "We all are worried about the consequences of the blockade on Palestinian families. Nonetheless, we must understand why Israel is forced to do this." Obama's letter was not meant to respond to the urgent needs of the voters, but to continue the necessary process of recent weeks: Combating the rumors that he would be a president who does not support Israel, and even worse, rumors claiming he is Muslim, and that he doesn't tend to pledge his allegiance to his country, and so on and so forth. It is not by chance he is being photographed at more churches lately - and explicitly stating he is a Christian. It is not by chance he decided to get involved with the Gaza issue; no other campaign commented about the issue in detail Wednesday. I understand that today the UN Security Council met regarding the situation in Gaza, and that a resolution or statement could be forthcoming from the Council in short order. All of us are concerned about the impact of closed border crossings on Palestinian families. However, we have to understand why Israel is forced to do this... Israel has the right to respond while seeking to minimize any impact on civilians. The Security Council should clearly and unequivocally condemn the rocket attacks... If it cannot bring itself to make these common sense points, I urge you to ensure that it does not speak at all. For a more detailed account of Obama's relationship with Israel, see this article from Ali Abunimah of The Electronic Intifada, entitled "How Barack Obama Learned to Love Israel." Barack Obama on the Middle East: Is it wise to hope that as president, Obama would be more progressive than he is letting on? And on Diplomacy: With his preference for diplomacy over militarism, we must neither be naïve about Barack Obama's limitations nor cynical about his potential. Hillary Clinton on Iraq: Hillary says she wants the troops out. But does she really? On International Law: When it comes to human rights around the world, Hillary Clinton is little more than Bush Lite. On her military policy: There's every indication that it closely parallels that of the Bush administration. John Edwards: The charismatic populist has staked out progressive positions on important domestic policy issues but on foreign policy, however, his record is decidedly mixed.